Allforit proudly operates out of our own private farm in Northern Virginia. Located just outside the town of Purcellville in the beautiful Loudoun County the farm is convenient to Area II events in Virginia, Maryland, and Pennsylvania, and Region I dressage competitions. The training program specializes in starting young horses. The horses are brought along slowly and correctly with confidence and patience, preparing them for successful careers in multiple disciplines. Tiffany Catledge proudly offers customized training and lesson solutions for students of all ages and levels. Students at Allforit Farm gain the skills and confidence to compete successfully in whichever discipline they choose. 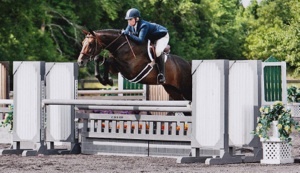 Through positive training techniques, horses and riders receive the solid foundation that they need to reach new levels of success in dressage, eventing, show jumping, equitation, and hunter disciplines.